Thirty-year LIRR commuter Carl Sicilliano paid $200 for his monthly ticket between Bay Shore and Penn Station in 1999. Today, he pays $391, and under the MTA's fare hike plan he would next pay $405. 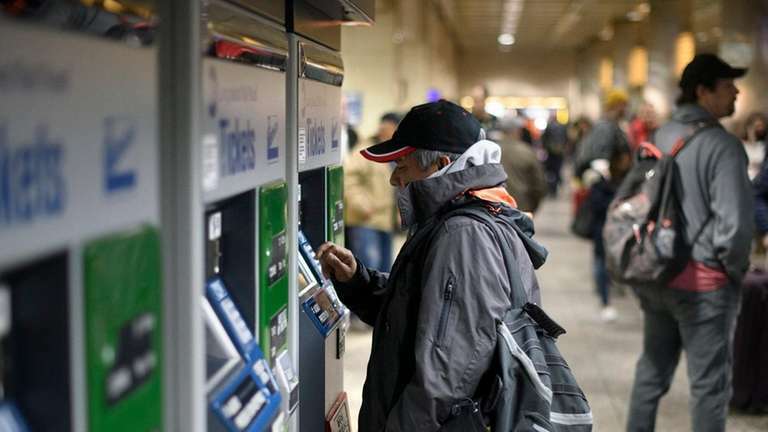 The average monthly Long Island Rail Road ticket will have doubled in price over 20 years under the MTA’s latest proposed fare hike — far outpacing inflation and income growth in Nassau and Suffolk counties over the same period, according to a Newsday analysis. Data show the average monthly ticket has gone from $170 in 1999 to $334.50 today, and would climb to $344 this spring under the Metropolitan Transportation Authority’s plan to raise the fare by 4 percent. The new fare would, on average, represent a 102 percent rate hike over a 20-year span. For some commuters, it would be closer to 120 percent. Mark Epstein, chairman of the LIRR Commuter Council, the railroad’s state-mandated rider advocacy group, has said the fare hikes are unsustainable and eventually could drive commuters to quit high-paying jobs in New York City to work closer to home, or to leave Long Island altogether. “That’s a huge increase over the last 20 years,” Epstein said. “It can’t continue. It’s not a question of people not wanting to. People can’t. They can’t afford it." The MTA has defended its strategy of raising fares by about 4 percent every other year, noting the increases are less than the growth in the agency's expenses and less than the annual inflation rate of just over 2 percent. In a statement, spokesman Aaron Donovan also noted that the increases "come at a time when the MTA is making unprecedented levels of investment in the system." "We are pursuing the LIRR Forward plan to improve safety and on-time performance, and investing $6.6 billion in 100 capital projects like Main Line Third Track that are transforming and modernizing the LIRR and making up for past underinvestment," Donovan said. But the rising costs of LIRR fares far exceed the total rate of inflation in New York over the last 20 years — about 55 percent, according to the U.S. Bureau of Labor Statistics — and the growth of median household incomes on Long Island, which is about 86 percent in Nassau and 82 percent in Suffolk. The cost of a gallon of unleaded gasoline has risen by 88 percent over that time, from $1.30 to $2.41. Another point of comparison, NJ Transit — the second-busiest commuter railroad behind the LIRR nationally — has raised fares about 80 percent since 1999. Carl Sicilliano, a commercial insurance underwriter, paid $200 for his monthly ticket between Bay Shore and Penn Station in 1999. Today, he pays $391, and he would pay $405 under the MTA’s new plan. Adding the price of a monthly MetroCard, Sicilliano’s total commuting costs would be more than $6,400 a year. The LIRR carried nearly 90 million people last year, a modern record. It’s also among the most expensive, charging distance-based fares that range from $190 to $500 a month. In comparison, the cost of the most expensive monthly ticket on NJ Transit is $480; on Boston’s MBTA, it’s $398.25; and on Philadelphia’s SEPTA, it’s $204. In a 2017 study, California commuter line Caltrain calculated the fare cost per mile for LIRR riders at 24 cents, below only its sister MTA railroad, Metro-North, NJ Transit and Amtrak’s Capitol Corridor service in California. The MTA, which has followed a schedule of raising fares every other year for the last decade, has said regular, predictable fare increases are necessary to address growing labor and debt costs, and to help avoid large deficits, deep service cuts, or both. Labor costs, including wages, benefits and pensions, account for about 60 percent of the MTA's expenses — up slightly from about 58 percent in 1999. Debt service rose over the 20-year period from about 12 percent of the MTA's total costs to about 16 percent. Fares cover about 40 percent of operating costs at the MTA, whose annual budget has grown from about $6 billion in 1999 to about $17 billion this year. The MTA gets its other funding from bridge and tunnel tolls, dedicated taxes and government subsidies. Even with the planned hikes this year and again in 2021, MTA president Patrick Foye told lawmakers at a State Legislature transportation hearing in January that, without a new revenue stream, the agency may have to raise fares by another 27 percent over the next five years. “I’d be less than candid if I told you that we didn’t need those fare and toll increases this year and in 2021,” said Foye, a regular commuter on the Port Washington line. Port Jefferson commuter George Basile said the deterrent effect of LIRR fare hikes comes as a new generation of commuters “desperately wants to use public transportation” because it’s more efficient and environmentally friendly than driving. He said scaring away potential customers with high fares could cost the LIRR more money in the long run — money that could go toward improvements. Widespread opposition to the MTA’s latest fare hike proposal led the agency’s board to postpone a planned vote last month on the increase until Feb. 27. Board members said they’ll use the time to consider other options. The new fares originally were scheduled to take effect in March, and the MTA has said it will lose $25 million for every month they are delayed. The board’s only member representing Long Island, Mitchell Pally, of Stony Brook, has said among the options being discussed by board members are fares that would be tied to performance, and potentially raising fares more for infrequent users of the railroad, including one-way ticket buyers, and less for monthly ticket-holders. Pally has for years urged the MTA to conduct a thorough review of its fare policy — even questioning whether it makes sense for Suffolk commuters to pay the highest fares for the longest commutes. While echoing calls for increased belt-tightening at the MTA, the Citizens Budget Commission, a nonprofit state watchdog group, has warned against straying from regular fare increases. It reasons that cutting off the critical revenue stream could result in deferred maintenance and other cost-cutting measures that will cause LIRR service to further deteriorate. The group has said having riders pay about half the railroad’s expenses — more than they do now — is fair. But Martin Melkonian, associate professor of economics at Hofstra University, said relying on fare revenue to fund the MTA's growing expenses is "wrongheaded," because a healthy transit system benefits all of society, including by reducing traffic congestion and accidents, expediting the transport of goods, and helping the environment. If anything, Melkonian said, the lawmakers should be trying to find ways to reduce fares and encourage more transit use. "The burden of the fare hike really falls on average, working people, which is not a good thing. It's really kind of a regressive tax," said Melkonian, who called the rate of fare increases on the LIRR over the last two decades "rather remarkable" and "quite harmful." "I understand that the public authority may be losing money, but that's the case for arguing for greater governmental assistance," Melkonian added. "This is a governmental responsibility."